For those speaking Swiss German, Badi evokes summer like few other words. For those who don't, it is very difficult to translate. 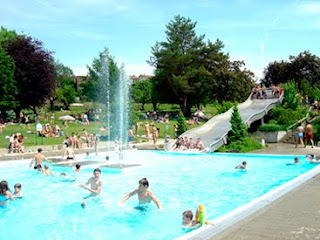 The German Freibad, English outdoor pool and even the French piscine de plein air all describe a swimming pool under the open sky. But they fall woefully short of capturing the entire concept that Badi entails. For it is a quintessential ritual that goes far beyond taking the plunge in a public pool. In summer, the Badi is the place to be - and every semi-decent Swiss town has got one. Unlike their counterparts in other countries, Swiss outdoor baths typically come complete with large areas of lawn, where families set up camp on a few blankets, and they all inevitably include an ice cream stand. If you're lucky, your local Badi sports further attractions such as a water slide or a beach volley court. It's not just a concrete-framed pool. As as toddler, I would frolic in the wading section while dad was patiently sitting on the edge. A few seasons later, my bright orange swimmies kept my self-esteem afloat, as I crossed the entire width of the basin before duly being rewarded with ice cream by my mum. Soon after, with joining the local swim team I learned not just to do full laps without swimmies, but also to use the washrooms. ;-) And yet, although I am certain today's kids also pee in the pool, I live to tell. By the time I had reached high school, buddies had replaced parents in the Badi equation, and we would spend countless free afternoons lazing on the lawn, every so often venturing out to the volley courts, only to find that our chemistry textbooks had still not been stolen by the time we returned. The laws of physics, in the light of some teenage girls' bikinis, had lost all credibility anyways. With adulthood came more responsibility, but less time, leading to frequent and widespread complaints about the fact that it was already the middle of June and we'd only made it to the Badi twice so far. Between a more rational mind and being charged full price, we had stopped buying season passes. But yesterday, I returned to the Badi. I swam a few laps in the summer sun, laid my blanket down on the lawn, sat and surveilled the scene. I saw toddlers stumbling towards the wading pool. Kids shouting and playing as they raced down the water slide. Teenagers engaged in an applied biology lesson. Grown-ups making for the shade so they could see the screens of their iPhones. All nostalgic, I realized how much time I'd spent in the Badi, and how much I had longed to relive this summer ritual. There was only one last thing missing. I bought ice cream.